Don’t send those potato peels to the trash bin. You can make this recipe with the peels from just two potatoes. Or, for a large lot, freeze the peels until you’re ready to defrost and bake. 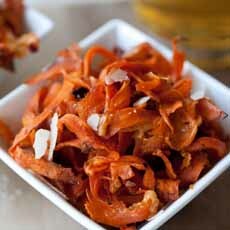 Sweet potato peels work, too, as do carrot and other root vegetable peels. 1. PREHEAT the oven to 400°F. Line a rimmed baking sheet with parchment paper or foil. 2. TOSS the potatoes with the olive oil, salt and pepper, and bake until crisp, 15 to 20 minutes. 3. SEASON with salt and pepper. Sprinkle with garnishes and serve immediately. Turn peels into chips (photo courtesy Covetop Cook). 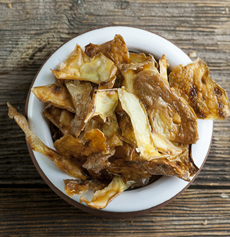 Sweet potato peel chips (photo courtesy What’s Gaby Cooking). 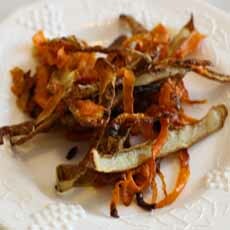 Potato and carrot peel chips (photo courtesy Life Hacker | Australia. Keep an eye out, and you’ll find many ways to use kitchen scraps that are fun to make and eat, and a contribution to a better environment.